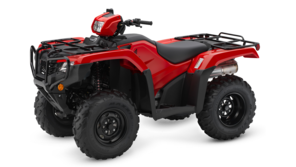 TRX500FE2: Switchable 2/4wd – 5 forward/1 reverse gear, auto clutch, power steering and electric shift. Some days you feel like it’s all uphill. Lucky you’ve got the 500 working for you. The low-down torque from the liquid cooled engine lets you tackle the really rough terrain, as well as those big towing jobs. Experience has taught you well and you know one thing above all else – you can rely on a TRX500. 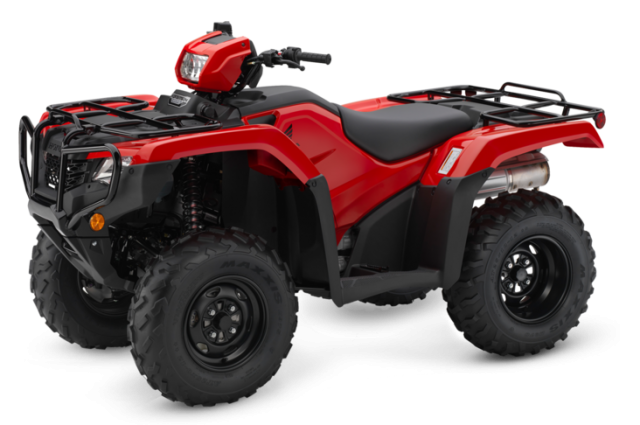 Ready for whatever you’re doing, the 500’s triple headlight system uses a single 45-watt upper bulb and dual 30-watt lower bulbs with multi-reflector lenses for optimal light distribution, plus an LED brake light/taillight for improved visibility. TraxLok® lets you easily select 2wd or 4wd. 2wd gives lighter steering on flat ground while 4wd maximizes traction when you need it. The working day can bring many challenges. Five forward gears, including an ultra-low first – plus reverse – mean you’ve got plenty of pulling power. true engine braking also helps maintain control. Electric Shift Programme (ESP) adds effortless handlebar-mounted push-button gear changes. The PGM-FI fuel injection system – with 36mm throttle body – provides instant and crisp throttle response, consistent performance at altitude and hassle-free cold-weather starting. Power Steering helps eliminate bump steer and lessons steering effort, particularly over rocks, logs and on sidehills. The engine is longitudinally-mounted. With the crankshaft in line with the frame you get direct driveshaft alignment to the wheels, improved drivetrain efficiency and a low centre of gravity. 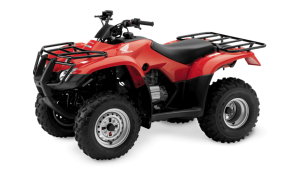 And it’s a major contributor to great stability, handling and balance, all features you expect from a Honda ATV. The massively strong steel swingarm allows 185mm rear wheel travel. Adjustable spring preload ensures well-controlled power delivery as well as increased comfort, precision and work capability. Brakes: Dual front discs feature brake calipers with a patented built-in scraper system to remove mud and snow. Radiator: Large radiator and fan ensure optimal cooling under tough operating conditions. 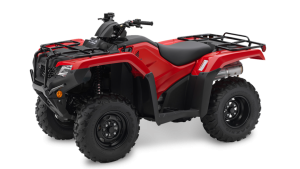 Starting: Electric starting also features auxiliary recoil. Suspension: Independent double-wishbone front suspension ensures smooth progress over rough terrain. Exhaust: Exhaust and muffler are stainless steel for long-term durability. Cargo racks: Large racks feature an improved design for easier lashing of cargo. Trailer hitch: Axle-mounted, heavy-duty trailer hitch with up to 600kg towing capacity. Storage: Rear-opening storage compartment allows access when the rack is loaded and there’s a water-resistant left-side glovebox. Accessory socket: Waterproof accessory socket provides 12-volt, 10-amp power. Floor: Unique floorboards allow the rider’s feet to grip the footrests while keeping away mud and debris. Transmission Five-speed with reverse, manual or ESP Electric Shift. Fuel Capacity (l) 14.7L, incl. 4.9L res.